iPower Web is a web hosting and web design company, offering Windows and Linux shared hosting plans, and Linux based VPS plans. If your business requires a Windows VPS, we recommend: MyHosting.com. Each of their VPS plans comes with $100 in Google AdWords credit, $25 in Yahoo Search credit, $50 in Facebook Advertising, and a free yellowpages.com listing. You have the option to use an existing domain, or to get a new one (free for the first year with qualifying plans.) When you make a purchase, you get a 30 day money back guarantee, so you'll get a month to try the service before you decide to keep it. The pricing listed here is applicable for both one and two year service agreements. You can also purchase three and six month long plans, but you will have to pay a $30 setup fee if you purchase less than six months at a time. 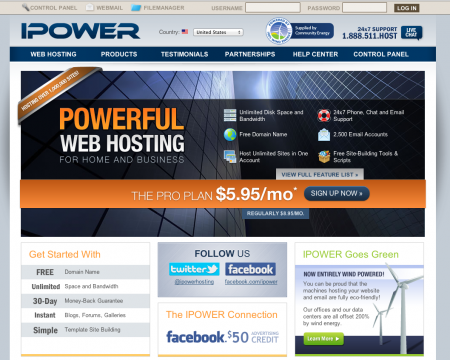 iPower Web is a good way to get started with VPS web hosting. The features are fairly basic, but most small businesses won't require more than what these plans have to offer. They're also a good option if you want to get your design and hosting from the same company.